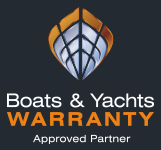 SECOND HAND BOAT’S WARRANTY, GET PROTECTED! MarinaGrup is pleased to announce our partnership with Boats & Yachts Warranty, the leading marine warranty provider in Europe. You can protect yourself from costly repairs on both new and pre-owned vessels with a Boat & YachtsWarranty Plan. It’s an easy way to limit out-of-pocket expenses due to mechanical breakdown. Your boat is likely to be one of the largest investments you’ll make in your life, so why leave it without mechanical breakdown protection? Most new boats and yachts are backed with a hull and engine warranty for 1 or 2 years; our extended Warranty Plans will prolong the coverage of your engine and systems for up to 20 years. Pre-owned boats, on the other hand, are generally sold “as is”. Our extended Warranty Plans add a layer of protection to your purchase and lets you buy a pre-owned boat with peace of mind.